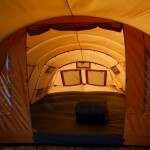 Will Thermo Tent Be A Viable Playa Housing Option? A new Kickstarter campaign for the Thermo Tent promises to address the the temperature range issue for comofortable sleeping in the desert. Using a proprietary inner tent gives the Thermo Tent the ability to mitigate the temperature swings, the designers of this tent use the inner liner to capture an insulation material between the two layers. Early subscribers to the Kickstarter campaign are being promised a July 2015 delivery date, soon enough for this year’s burn.